In addition, there are plenty of floral displays, such as cream-colored poinsettias filling the Winter Garden Room at Biltmore, and garland galore. And live instrumental music. And choirs. And more. During the holidays, Biltmore also offers evening self-guided tours of Biltmore House, where you can see the Vanderbilt’s home in a romantic light, with logs crackling in the fireplaces and candles lit, as well as all the twinkling lights on those 56 trees. If you are a guest of the Inn on Mill Creek B&B, you can purchase discounted Biltmore daytime admission tickets for $49/person with no added fees. Your ticket to Biltmore can be used any day of the week, and can also be used to enjoy more of Biltmore the following day at no charge. 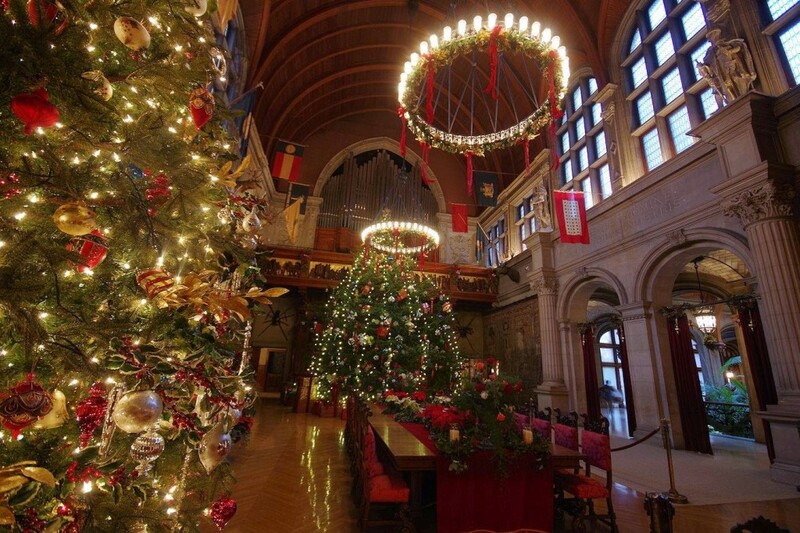 You can then upgrade your daytime ticket to add a Christmas Candlelight Evenings tour of Biltmore House for just $15/person. Reservations must be made in advance for the evening tour as times sell out quickly. We love to make getaways easy on our guests, so save some time on planning and allow us to make all of the arrangements for you for your Candlelight Christmas Evenings tour. Simply let us know which evening and timeframe is best for you. The Inn on Mill Creek B&B is located just outside the town of Black Mountain, NC, two miles inside Pisgah National Forest. Asheville and the entrance to Biltmore Estate is about 20-25 minutes west of the Inn. This entry was posted in B&B Specials, Biltmore and tagged Asheville, Biltmore, Christmas, festivals and special events by Inn on Mill Creek. Bookmark the permalink.